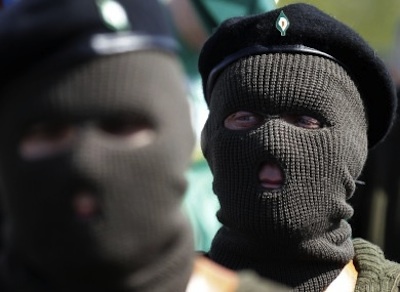 The dramatic announcement yesterday that the three strongest Republican militant groups are to coalesce into a new entity is the biggest development in militant republicanism since the signing of the GFA. It represents a broader recognition by many Republicans that the armed campaign to date has faltered, not politically since the underlying rationale remains the same but through a lack of capacity to wage a sustained assault on the British presence. The majority of Republicans support armed resistance that is undoubtedly true. The political groups which support armed action dwarf those such as Eirigi or the IRSP. Given that those groups strategy is to build a much broader resistance they can only welcome this announcement. It is evidence of a sober and mature assessment of the state of the militant groups. It also shows a wider abandonment of ego and no doubt personal disagreements for the greater good. One of the core themes of the establishment and media attacks on the armed groups is that they are miniscule and factionalized. This will ring somewhat hollow as an organisation now exists which can extend its reach to anywhere in the 32 counties. The geographical isolation of the groups in their previous incarnation is no longer an obstacle. The new organisation will now have access to a large pool of experienced personnel and the stockpiles of equipment built up by each separate group. For those militant groups which were left out of the new arrangement by choice or by design the future remains uncertain. The provisionals used to delight in calling on the INLA to disband and for its members to join the Provos. Any such calls from the new organisation seem to be unlikely and are undoubtedly unwelcome. Each group must now evaluate for itself the rationale behind its campaign. The true decider of any groups merits will be its actions rather than words and should the IRA as presently constituted wage a sustained campaign then no doubt there are many who will take the decision to join the more effective group. The broader political implications of the new arrangement remain unclear. It seems highly unlikely that a new political movement will be created; the more sensible arrangement would be increased unity of action between existing political structures. In truth the announcement has not been a seismic political shift. The logic underpinning the continuation of the armed campaign remains the same, what has changed is the capacity to carry out such a campaign. The denial of sovereignty, partition and British rule in Ireland will continue to provoke an armed response. Those who politically support the right to resist have long made this argument and it has been proved to be right, the tenacity of such resistance is simply underscored by the recent development. From those who would attack or attempt to attack the new group from a socialist perspective their logic is redundant. The group has committed itself to acting as a military pressure on the British presence. Those who attack them for not articulating a broader social message are the very same individuals who attack such groups for being elitist, secretive and unsuited for carrying on the class struggle. The capitalist system is a barrier to true liberation. It must be dealt with and cannot be ignored from the political equation. However the manner in which it will be dealt with differs substantially from the manner in which a military campaign which is still finding its feet must operate. The total lack of radical action, indeed the moral cowardice of the left in the 26 counties has left those pushing for a more radical republican response to the economic crisis in a somewhat awkward position. It is clear that they have neither intention nor desire for challenging the state. It is also clear they have no intention or desire to work with Republicans. To hinge a strategy at this point on co-operation with the trade unions or organized left is wilful ignorance of reality. Those republican groups which disavow armed struggle and proclaim that a new working class mass movement will be built have nothing to show for their activity at present. Aside from the occasional publicity stunt activity they have failed to grip the imagination of either the working class or Republican youth. In the coming weeks and months the IRA will undoubtedly be busy if their initial statement rings true. No doubt they will come under sustained assault from both the state and the media. For all those who politically support the resistance the time has come to create a true political campaign which will be both cohesive and effective. Each activist of whatever group they may claim allegiance to must commit themselves to making a decision to give whatever time and effort they can to try and build the Republican political presence. The volunteers of the IRA deserve nothing less than the full and unwavering support of Republicans who support the right to resist. They are no doubt going to need it.